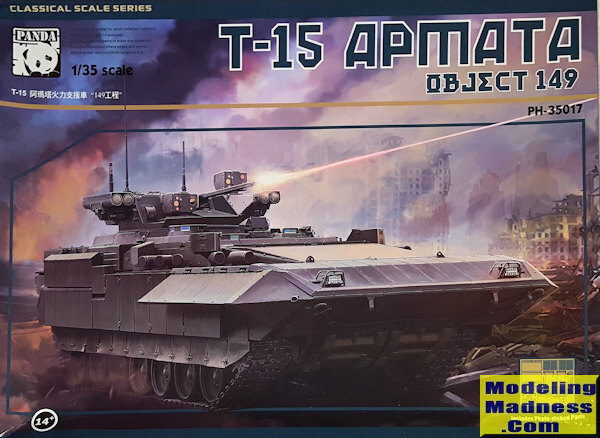 The T-15 Armata (Russian: T-15 Армата), with industrial designation "Object 149", is a Russian heavy infantry fighting vehicle first seen in public (initially with its turret covered) in 2015 during rehearsals for the Moscow Victory Day Parade. The T-15 is expected to replace the BMP-2 and MT-LB based platforms of the Russian Ground Forces. Panda Hobby wants to be your source for modern Russian military vehicles and has gotten off to a great start by doing some of the most modern vehicles around. This one is part of a series of vehicles that is based on the same running gear. Previously the MBT was released and now we have the IFV. First thing I noticed when ope ning the box is just how large this one is. The single piece upper and lower hull sections measure ten inches in length. The kit also comes with a photo etch fret. It includes things like the engine intake and exhaust screens, the containers for what looks like ammunition rounds that fit on the back of the hull and some rear hull compartment faces. These latter two items have teeny fasteners and handles to attach. There are also a few engine cover lift rings and antenna brackets made of this material. The tow cable is made of brass or copper wire. 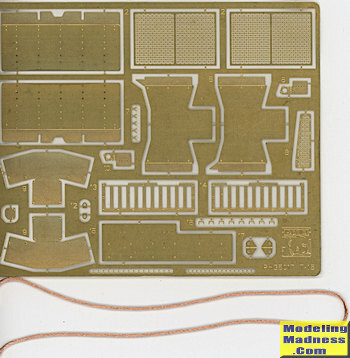 Panda expects modelers to want individual track links and you get eight sprues of plastic tracks. 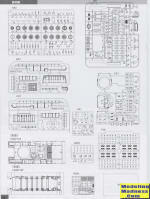 Each sprue includes an assembly guide, which will come in very handy as you will need 95 for each side. On each side of the lower hull are seven double road wheels and four return rollers. Much of this will be covered by the side skirts. On the upper hull is a lot of equipment. There are various equipment baskets, containers, and various interesting looking boxes and antennas. The driver's and co-driver's hatches have the 'do not stick' note next to them, though there is nothing inside to see. The rear compartment access door is apparently a closed only option. On the front is a large fording bow. Apparently all Russian IFV/AFVs are designed to be able to be submerged to some extent to assist crossing water courses. The flat turret is festooned with TOW missile launchers, sensors and antennas. The main gun has no breech, which is not an issue as there is nothing in the turret to see. In fact, it could be automatic and unmanned. 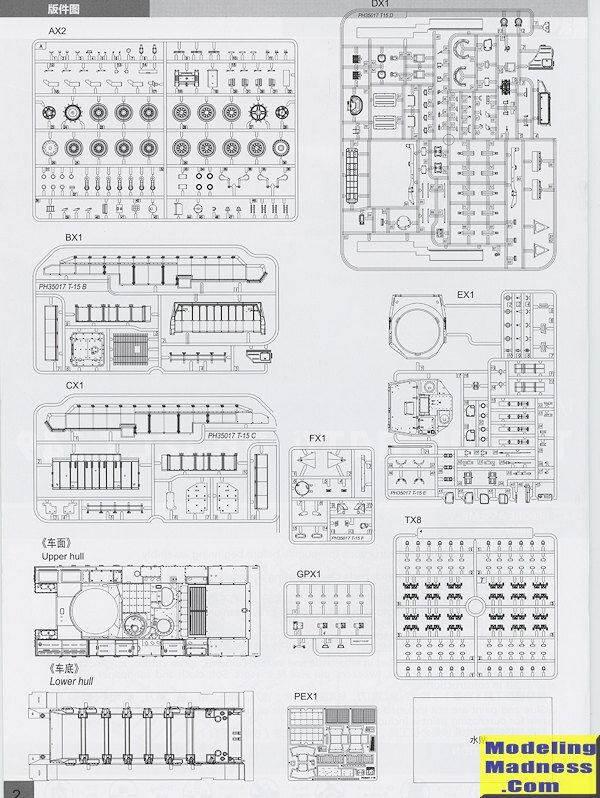 Instructions are well drawn and typically, there is no 'as you build' painting guide. The painting guide is for one anonymous vehicle with a stylized insignia marking on the side and is probably a prototype or preproduction vehicle. The guide shows it to be an overall FS 34079 or similar Gunze paint. The small decal sheet will prove to be quite thin so care will be needed when applying it. Those who model modern fighting vehicles will be quite pleased with this one. Due to the tiny p.e. bits, I'd not recommend this kit to anyone who doesn't have experience dealing with this material as it offers no plastic replacement bits. While some are not fond of separate track links, the truth is that they are not difficult to assemble, just a bit time consuming. They also look better than any 'rubber band' links when the kit is completed. It is a kit that will definitely look great on your display shelves. 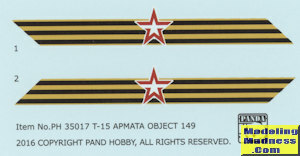 Thanks to Panda Hobby for providing the preview kit. You can get this at your local retailer.